Fashion Polish: Glam Polish Exotic Illusions Series : April & May! Glam Polish Exotic Illusions Series : April & May! Happy Monday! How was your day? I have not one but two Glam Polish trios to show you today. 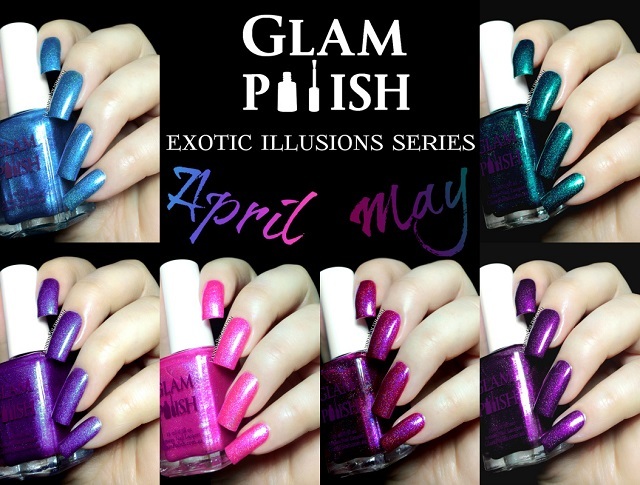 Glam Polish recently came up with a fun monthly series, the Exotic Illusions, and I have swatches of both the April and May sets! Application was nice and easy on all colors, thin but pigmented enough to achieve full coverage in 2 coats. Rose Dawn is a hot candy pink scattered holo with a strong icy blue shimmer. I used 2 coats plus topcoat. Tranquil Shores is a saturated sea blue scattered holo with a strong, camera shy, pink shimmer (I swear it's there in person!). I also used 2 coats plus topcoat. Peace of Mind is a warm purple scattered holo with fuchsia shimmers. Again, this is 2 coats plus topcoat. Twilight Echoes is a deep and saturated magenta scattered holo (almost linear) with bold blue shimmer particles. Another perfect 2 coater. Witching Hour is a royal purple holo with strong matching shimmers. Also an easy 2 coater. Infinite Wisdom is a teal green holo with strong gold shimmer. Again, perfect in 2 coats. This was my very first experience with Glam Polish but color me impressed! I really like the concept of a 3 months series and they totally make sense together as a whole. Deep, vivid, saturated and fun holos, they're all so unique! My top picks : all 3 May colors, I love love love them!!! The April and May Glam Polish Exotic Illusions Series are already available on glampolish.com.au. Individual shades retail for $11.95 each (Australia & USA shipping available). So what do you think about these 2 trios? Are you in the mood for bright colors yet? I can't wait to show you the June edition!